What's the most intimidating car to see in your rear-view mirror? Some cars just look more sinister when they're behind you, flashing their high-beams. In the left lane. On the autobahn. In the rain. With Michael Schumacher at the wheel. What's the most intimidating car to see in your rear-view mirror? We'll just get this one right out of the way. 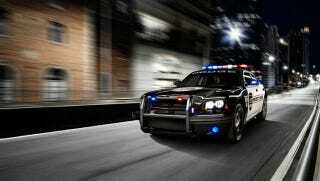 It's the Dodge Charger police cruiser. One look at that menacing grille and that angry push bar, and we're putty in the hands of the law.